The other week, a man in Australia was siphoning gas from a car while smoking when he lit himself on fire. We thought he was the only person dumb enough to do this. Apparently he isn't. Stop smoking and siphoning. Harry Suniville was siphoning gas from a nearly empty gas can in the back of a pickup bed while smoking. Guess what happened next. 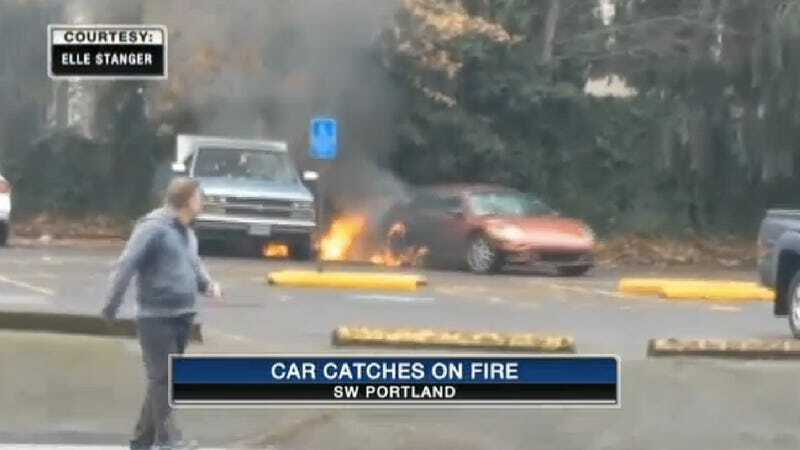 Yep, he lit himself, the pickup truck the gas can was in, and his Mitsubishi Eclipse on fire. He only received minor burns, but didn't get away. The fire burned off a tire on the Eclipse and police arrested him on multiple charges including criminal mischief. But that's neither here nor there. Why people are smoking while stealing one of the most volatile and highly flammable liquids on Earth is beyond me. Jalopnik's official stance on smoking and siphoning is to not do it since it's dangerous. We implore all of our readers to understand the dangers of smoking and siphoning and to think twice before doing it. If you have to smoke before you try and steal gas from someone, please put out your cigarette before committing the crime. When it comes to siphoning, please, safety first.